Our friend Evgenij Kharitonov returns to Earth Mantra with another resplendent collection of ambient electronic pieces called Low Sky. One of the hallmarks of Kharitonov's music is his surprising diversity. Every time we think we have figured out what genre label to apply to his music, he produces a new release that confounds our previous definitions. Thus far, on Earth Mantra alone, Evgenij has covered territory as far separated as dark ambience, light ambience, space music, electronic new age, textural ambience, and experimentalism. And now, with Low Sky, he delivers a single album that neatly encapsulates this broad array of ambient subgenres, an assembly of delightfully varying pieces that showcases Evgenij's multifaceted talents, and serves as a perfect introduction to his masterful work. One might be tempted to think of this diversity as a dissimilarity, a random collection of unrelated tracks. One would be wrong to do so, however, for there are several common threads between these pieces that pull them all together into a truly satisfying album. One such thread is the remarkable tonality of the music. In past releases, Evgenij has danced on the fringe of tonality, taking care to include as much texture and structure as lushness and musicality. With Low Sky, however, he completely embraces melody and tone, Even the title track, ostensibly a drone study with noise overtones, keeps one foot firmly in the realm of concrete tonality. We think fans of light ambience and of space music will find much to love in this album. The other common thread is the sound design. Evgenij has long demonstrated his mastery of sound sculpture, his ability to take relatively simple, straightforward elements and cleverly combine them into music of great depth and interest. With Low Sky, he applies this singular talent to the world of tonal space music, yielding a collection of pieces that simply blows us away. Remarkable, remarkable work. 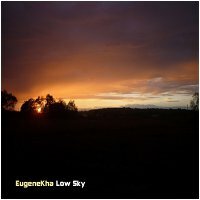 So with great pleasure, Earth Mantra unveils Low Sky, the latest release by Russian maestro EugeneKha. A genuinely great album that we highly recommend to all of our listening audience.